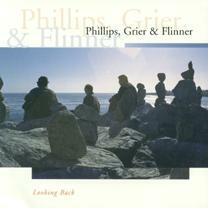 George Graham Reviews Phillips, Grier & Flinner's "Looking Back"
The New Acoustic Music scene has been around for over 20 years now, which I guess makes the term a bit of an oxymoron -- but be that as it may, it was in the late 1970s and early 1980s when a younger generation of bluegrass musicians who were raised on rock and jazz began to apply an eclectic approach to acoustic instrumentation. The artist most often credited with starting the scene is mandolinist David Grisman. Among the other seminal figures in the New Acoustic scene are guitarist Tony Rice, multi-instrumentalist Sam Bush, fiddle player Mark O'Connor, Dobro-meister Jerry Douglas and banjo virtuoso Béla Fleck. The current revival of interest in bluegrass is providing a new potential audience for this mostly instrumental, untraditional, but very appealing and musically edifying style. One of the founding members of the original David Grisman Quintet in 1978 was bassist Todd Phillips, who has been keeping active on the scene, recording on scores of albums, and also working as part of the Bluegrass Album band with Tony Rice. Phillips also won an Grammy for producing the CD True Life Blues: The Songs of Bill Monroe. Phillips has gotten together for a second time in an acoustic trio with guitarist David Grier and mandolinist Matt Flinner for a new CD called Looking Back, an all-instrumental recording that is an epitome of the New Acoustic approach -- a wide-ranging repertoire held together by stellar musicianship. David Grier's credentials include appearing on over ninety albums, including four under his own name, and recordings by Mark O'Connor, Jerry Douglas, banjoist Alison Brown, and the group Psychograss. Matt Flinner, a founder of the Colorado bluegrass band Sugarbeat, has released two CDs of his own, including Latitude which we featured in this review series, and he regularly tours with the bluegrass jam band Leftover Salmon, where he plays banjo, on which he was a prodigy in his youth, rather than mandolin. Looking Back, the new joint Phillips-Grier-Flinner project is in the classic New Acoustic style, with material drawn from sources ranging from Bill Monroe to the Beatles to jazz composers McCoy Tyner and Mongo Santamaria. The trio are not supplemented by any additional musicians or apparent overdubbing, and with just the guitar, mandolin and bass, I suppose the sound could be described as "chamber bluegrass," but the three manage to create a lot of sound, and perhaps more notable, interesting musical textures with their understated instrumentation. Their arrangements can range from introspective to unexpected in their treatments of the bluegrass standards, and to a lesser extent the jazz pieces. And yet, the CD has a very informal sound. All three are outstanding players who obviously enjoy each other's musical presence. And while the guitar and mandolin trade the spotlight, Phillips gets a good number of opportunities to be featured, in a couple cases, carrying the initial melodic line on his bass. This is a relatively subtle album -- there is not a lot of rip-roaring virtuosity to be heard, and there's no new original music to speak of, but each track has something worthwhile to offer in terms of the musicianship, the creative arrangements, or the musical interplay among the three pickers. After a good deal of activity in the 1980s, the New Acoustic scene was heard somewhat less during the following decade. But the current popularity of bluegrass has provided an opportunity for expanding the audience for this eclectic and musically stimulating genre. Bassist Todd Phillips has been in it since the beginning, and with David Grier and Matt Flinner, the three have created very enjoyable album in the classic form -- virtuoso playing with a wide-ranging set of influences. The three piece format, and the lack of fiddle or banjo, the more strong-voiced bluegrass instruments, gives the ensemble a distinctive, intimate sound that is quite appealing and allows one to partake of the album on a couple of levels -- as pleasing background listening, or as something to concentrate upon, savoring the musicianship, creativity, and interplay that these three fine instrumentalists bring to the music. Our grade for sound quality is an "A." The recording is like the music -- subtle and understated. Todd Phillips himself engineered the CD what is likely his own studio in the San Francisco area. The acoustic instrumentation is nicely rendered, and there is a better than average dynamic range. Phillips, Grier and Flinner's Looking Back represents some of the best aspects of what the New Acoustic scene has to offer. It's definitely a class act.